I flew out of Houston airport about 11 p.m. Saturday, June 23rd and arrived at the Buenos Aires airport 10 hours later, approximately 11 a.m. Sunday. It was my luck to have my luggage the second-to-the-last to come off of the plane as well as to end up behind a youth group of basketball players going through customs. The efficient Argentinian government personnel efficiently moved us through multiple lines before leaving the secured portion of the airport. There I was met by the conference organizer Mr. Pablo Nunez and Soledad Aldao. We did a bit of “must see” sight-seeing, which included driving and walking along the Avenue of July 7 (the English translation). 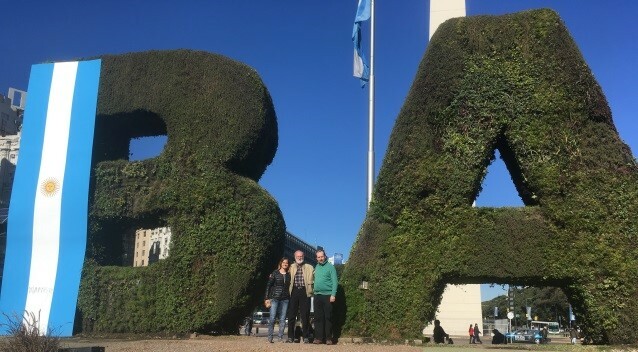 The other stop was at the “Obelisco” which was built in 1936 to commemorate the 400th anniversary of the city’s founding where we got to do the normal tourist duty to photograph the occasion. The Argentinian flag is on the left and “Obelisca” is in the background. The sky was so blue and cloudless! The photo on the right is a selfie with Grif, Pablo, and Soledad. The Obelisco is along the Avenue 9 de Julio (the 9th of July) named for Argentina’s independence day. I’m told this avenue is the second widest paved road in the world. It does require multiple crosswalks to move across it. After that, I spent a couple of hours at the guest hotel, followed by a group dinner at a local restaurant. We arrived there about 7:15 p.m. to a nearly empty room. Traditionally, dinner time in Argentina doesn’t begin until about 9 p.m. Our group was comprised of 8 forensic practitioners shown in the image. Pablo and Cristina Vazquez attended BGA BPA I in Salt Lake City in 2017 and Soledad Aldao was in our BPA I in Baton Rouge in 2014. Pablo is a member of several criminalistics associations and a professor in the specialty of analysis and investigation of homicide at the Institute Prueger, a forensic education and consulting group. Lorena and Mariana work with Pablo. His wife Albina does questioned document work. Soledad does crime scenes and BPA for the Buenos Aires Police Department. Andy Maloney is the designer of HemoSpat. From left to right: Mariana (co-worker with Pablo Nunez), Grif, Soledad, Andy Maloney, Pablo and his wife Albina, Cristina a private consultant, and Lorena, another co-worker with Pablo. Monday morning Pablo picked up Andy and me, and we went to the two-month old building for the Chemical Laboratory of the Argentinian Federal Police.